Campsite les Bords de Loue pitch only campsite is located in Parcey in the Jura region of France. 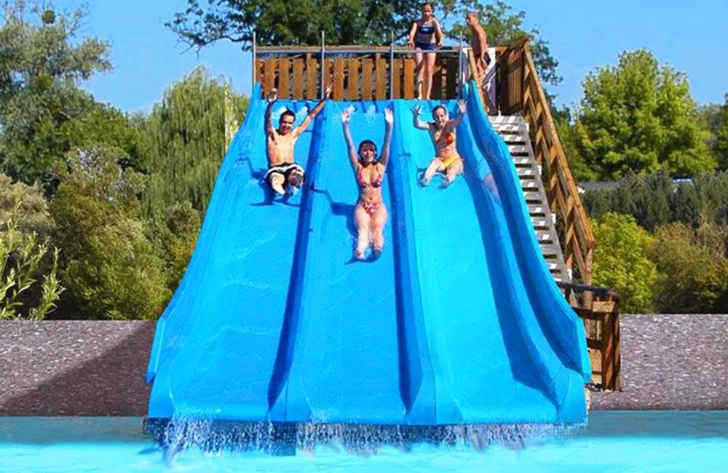 Campsite les Bords de Loue is a lovely family friendly campsite that gets its name from the fact it’s alongside the river Loue. Set on a strip of land between the river and the canal the campsite covers approximately 17 hectares with woodland on one side and open space on the other which offers plenty of space to relax and have fun. If there’s one thing you’ll notice about Campsite les Bords de Loue it’s how green everything looks. The campsite grounds are clearly well maintained with a variety of trees, shrubs, plants and flowers everywhere you look which is very relaxing. One of the best things about Campsite les Bords de Loue is its river setting. The campsite has its own pebble beach and the waters around the beach are very shallow and don’t really have much of a current so are perfect for children. There are plenty of things to do on the river including kayaking, canoeing and fishing and of course with the low currents and shallow waters children can safely swim, skim stones and build dams. As a region, the Jura is highly popular with those looking to explore the great outdoors. The stunning natural environment makes the perfect place for those more active families who want to get out and enjoy all nature has to offer. Located a short distance from the campsite is the Foret de Chaux which is the second largest forest in France. There are an endless number of walking, hiking and cycling routes throughout the forest which will keep you busy. Although you have the private beach for swimming, Campsite les Bords de Loue also offers a fantastic little swimming pool area which includes a heated family pool, toddlers pool and some slides. The pool is great for families and an ideal place to relax following a long day of fun. On-site activities at Campsite les Bords de Loue include a playground, volleyball court, multisports field, boules, table tennis, tennis, mini golf, pony rides, cycle hire, karting, canoeing, kayaking and fishing. This pitch only campsite is perfect for campers with tents, caravans and / or motorhomes. Facilities include: WIFI, takeaway, pizzeria, bar, snack bar, grocery shop, animation team, tv room, games room, washers, dryers, laundry sinks, washing up sinks, ironing facilities, washbasins, individual wash cabins, showers, standard toilets, baby room, children’s sanitary facilities and chemical toilet disposal points. The camping pitches at Campsite les Bords de Loue are around 90m to 110m2 in size. Click the button below to book a camping pitch at Campsite les Bords de Loue with our travel partner, Suncamp.